As a car consignment store operating in North Carolina, CarLotz has a responsibility to ensure that the thousands of for-sale-by-owner vehicles we offer will all pass a NC DMV inspection. As North Carolina requires all vehicles to pass a safety inspection before registration, we want to help provide some answers to car owners about the most frequently asked questions regarding North Carolina car inspections. Every car, truck, and motorcycle owner in the state of North Carolina is subject to a vehicle safety inspection each and every year. These annual check-ups are designed to make sure that every vehicle on the roads in North Carolina is properly maintained, which makes driving safer for you and others. All NC vehicle owners are obligated to comply with the North Carolina Department of Motor Vehicle’s inspection laws, with the only exception being vehicles older than 35 years, which are considered Antique Vehicles and are exempt. How do I prove that my car has passed inspection? As we mentioned, North Carolina drivers are required by law to pass a vehicle safety inspection every year. Of course, this means that each vehicle has to be documented as part of the inspection process. When your vehicle passes its safety inspection, you are issued a receipt with the date, station, results of inspection, and your inspection information. This is all added into the DMV’s vehicle registration database. Unlike states like Virginia, North Carolina no longer issues stickers upon successful completion of an inspection. 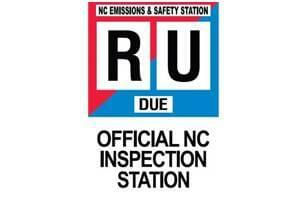 What is the NC Emissions Inspection? Annual emissions testing determines whether your vehicle’s pollution control systems are working as designed. There are currently 48 counties in North Carolina that require vehicle owners to pass both an Emissions Inspection and a Safety Inspection. This is performed using the vehicle’s On-Board Diagnostics and is usually completed in conjunction with the annual safety inspection. If your car successfully passes the NC car inspection but fails emissions, then you may be eligible for a waiver if you meet the requirements listed here. However, all vehicles need to pass the yearly safety inspection before the vehicle’s registration will be renewed. What are the NC Inspection requirements? Again, the State of North Carolina requires that safety inspections must be completed annually, which ensures that cars driven on state roads meet minimum safety standards. These inspections help reduce accidents and related injuries by making sure all systems are running as intended. All lights must be mounted properly and have no cracks in the lenses. A full list of the North Carolina Motor Vehicle Safety Inspection Rules and Regulations may be found here. There are over 7,500 NC inspection stations in the state. In the 48 counties that require additional emissions testing, inspection stations perform both tests at the same time. Additionally, any vehicle sold at retail within North Carolina must pass the necessary inspections no more than 12 months prior to sale. If a vehicle owner in a non-emissions-testing county moves to a county that does require emissions testing, the owner does not need to test the vehicle until its current registration expires. New residents to North Carolina may register their vehicle without an inspection. Visit the North Carolina Department of Motor Vehicles to find the nearest inspection station to you. How much does car inspection cost in NC? In North Carolina, an annual vehicle safety inspection costs $13.60, and a certified NC Vehicle Inspector must administer the inspection. For residents in the 48 counties that require On-Board Diagnostic Emissions inspections, the price is $30, which includes Emissions and Safety inspections. Additionally, aftermarket window-tint testing costs an additional $10 for Emissions and Safety inspections. What happens if my vehicle fails a NC Vehicle Safety Inspection? In North Carolina, if your vehicle fails an Emissions Inspection, the vehicle can be presented for re-inspection within 60 days of the original failed inspection. If the vehicle is presented for a second inspection within the time limit, and the inspection the vehicle failed was a safety inspection, then only the failing components will be re-evaluated the second time. If the vehicle originally failed an Emissions Inspection, the re-inspection is limited to the portion of the inspection the vehicle failed and any other part of the vehicle that may have been affected during repairs to correct the original failure. However, if your vehicle meets any of the criteria laid out in North Carolina General Statute 20 – 183.5, you may be eligible for a waiver. Do Antique Vehicles need to pass a NC Vehicle Safety Inspection? Antique Vehicles (those that are at least 35 years old, measured from date of manufacture) are not required by law to undergo North Carolina Vehicle Safety Inspections. Do motorcycles need inspection in NC? Yes. Motorcycles in North Carolina must undergo Vehicle Safety Inspection, but motorcycles are exempt from emissions testing. By following this link you can find additional information pertaining to North Carolina’s Motorcycle statutes. Failure to comply with annual Safety and Emissions Inspections can lead to severe fines. Vehicles must complete Safety Inspections for registration to be renewed. If Inspections are not completed 90 days before your registration expires, your registration renewal will be blocked. If you sell your car through CarLotz, your vehicle will automatically receive a NC inspection for free as part of our consignment service. 0 comment(s) so far on What is a North Carolina Vehicle Safety Inspection?